CIO Perspectives events bring together the expertise of the CIO brand’s extensive network of Chief Information Officers, senior IT executives and technology experts from across multiple industries. These day-long, regionally focused forums take place annually in nine cities across the country. The agendas are created with the direct guidance of CIO advisory boards in each region to ensure that every session is relevant and timely for CIOs and leading IT practitioners at midsized to large enterprises. The range of topics covered in our keynotes, presentations, panel discussions, workshops and lively peer discussions include sessions such as these. Join us for an invaluable day of learning and networking. Join us for unparalleled professional networking, rich content and a superior event experience at a city near you. Information about upcoming 2019 CIOP events will be posted soon. In the meantime, please refer to agendas from the 2018 events. Join our executive ecosystem and build relationships among today’s technology leaders while driving awareness of your brand. Sponsorship opportunities include speaking, exhibiting and private events. Don’t miss this opportunity to connect with leading CIOs to showcase your thought leadership as a key player in the technology space. Watch, listen and learn as CIOs around the country talk one-on-one about business strategy, tech innovation, IT leadership, digital transformation and more with host Maryfran Johnson. 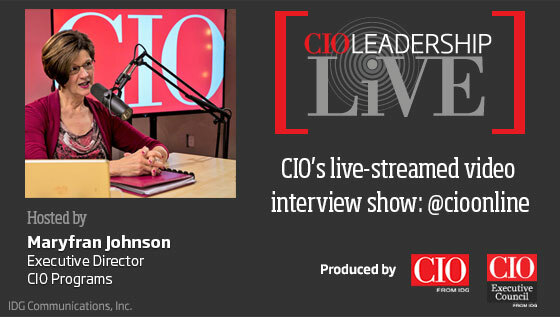 Watch episodes live-streamed on twitter @CIOonline.